A lot of my sewing at the moment hasn’t been for me. I haven’t made a garment for myself since the vintage dresses and the vintage pledge I made back in August! I bought quite a few vintage patterns to have a go at but unfortunately other projects have taken over and they have been sat in a drawer for a while. I have decided that I would like to make something for myself once per week. Last week I made the cute little bag, but it doesn’t really fit into the ‘clothing’ category! I was very impressed with how little fabric this used. The pattern fit perfectly on a folded 44″ wide fabric. I bought the green material on one of my first fabric shop outings here in the US; it was a bargain at $2.50 per yard. Piecing the top together was simple and the instructions were clear. 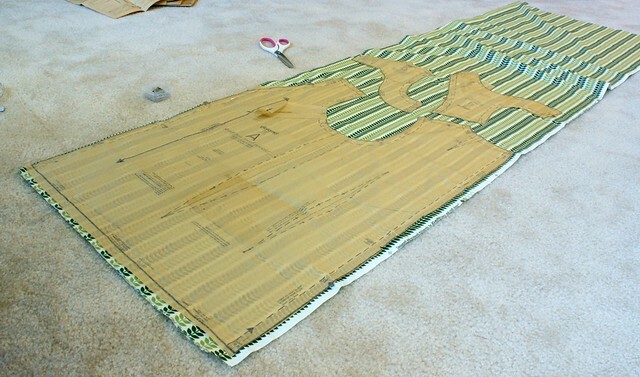 Next time I use this, I will probably use a light interfacing on the facing pieces to add a little bit more structure. 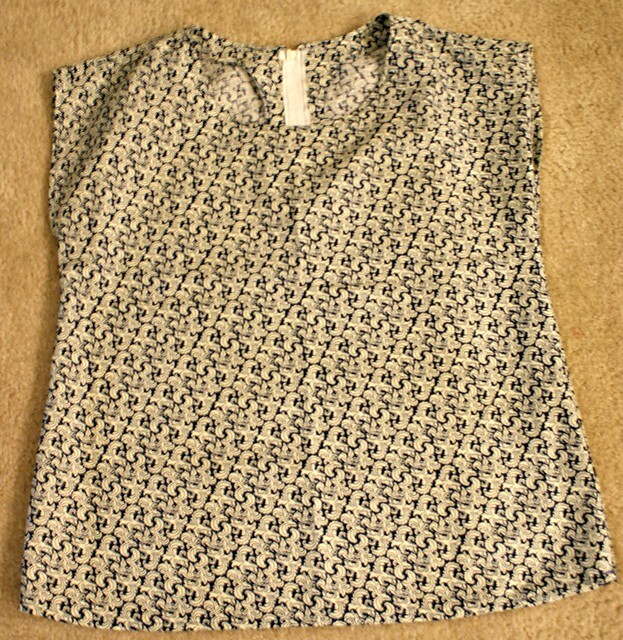 I still haven’t decided whether to put a bow or buttons on the front… or just leave it plain. Once I had made this top, I had the garment making bug again so had a quick go at making the zippy top from See Kate Sew. 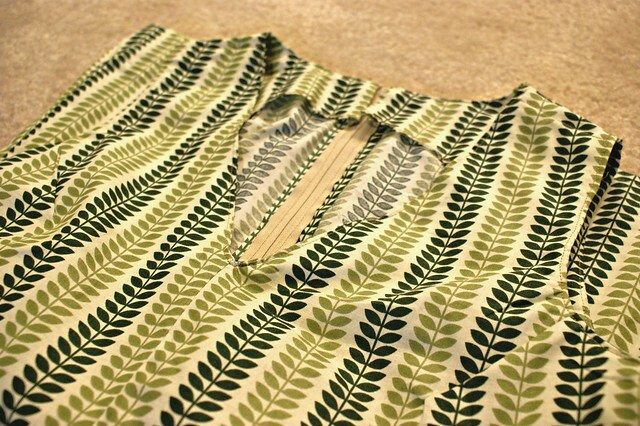 This is a great quick pattern to cut and sew together. I actually used a different way of inserting a zipper, which I prefer to the other methods that I know. I love the elegant swirly fleur de lis style print on this fabric but it was being naughty for the camera and didn’t want to be focused on I will definitely be making many more of these tops as they are a perfect for hiding muffin top tummies! Love the pattern and both of the tops, I haven’t been brave enough to make anything with stripes yet, was it tricky? 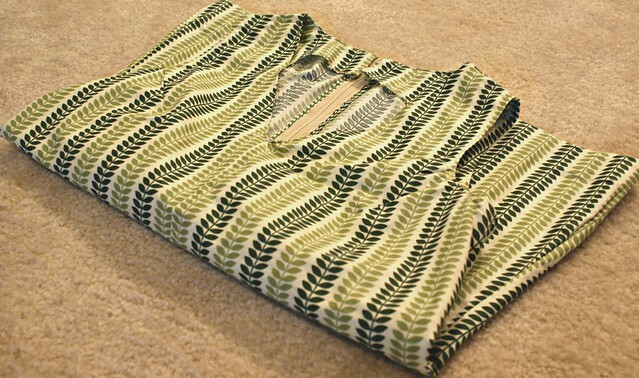 I absolutely love the fabric with the green vines. It’s perfect for the pattern. Even back then there was a massive price differential between Canadian and American prices! Love the top! I have to ask: were you making the one in the yellow with the notions? Where are the notions?! Yes mine too! I did think about a crochet flower for the centre or the shoulder but wasn’t sure whether it would be too much with the busy fabric! That’s true! It could make it a bit cluttered since it would mean including another texture. You could always add a crochet flower as a brooch? Or as a detachable piece! I adore vintage clothing! I can’t sew to save my life, but I’m a huge thrift store shopper and am always looking for great retro clothing items to add to my wardrobe. Love the fabric you selected!